Mr Cavil posted the image on 16 July. 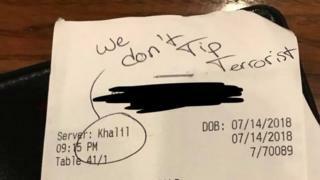 A receipt indicating that no tip had been left on the $108 bill appeared to show a scrawled racist note. His name, Khalil, had been circled and the message “we don’t tip ********* [sic]” handwritten on the top.